A moderately busy small or home office is the target audience for the Canon Pixma MX922, a $200 (as of 06/28/2013) color inkjet multifunction that can handle every office chore from automatic two-sided scanning and printing, to faxing and printing optical media. Output quality and speed are good, too. But the party ends with the ink costs: The MX922 ships with low-capacity starter cartridges, and the regular and larger cartridges are no great bargain. The Canon Pixma MX922 is a well-rounded multifunction inkjet printer, literally as well as feature-wise. It has Canon's signature rounded corners, a beveled top and bottom, and the same wrap-around front panel and small flip-open ink access lid as its Pixma MG6320 cousin. However, it retains Canon's dodgy, last-generation controls, with the three action buttons and separate four-way cursor. The issue with these is that some functions are available only via the action buttons, and some only via the contextually lit cursor/okay buttons. It's confusing, inefficient, and--if you use the panel often enough--aggravating. On the plus side, the button grid transforms into a keypad when you need to use the unit's fax capabilities. Installing is MX922 is easy, if a wee bit tedious. There are quite a few dialogs to click through, but the install routine found the printer on the network quickly and there were no other glitches. We used Wi-Fi, but you may also connect directly to a PC via the unit's USB 2.0 port, or wire it to your network via ethernet. The software is the usual efficient Canon bundle, with its veteran scanning utility, Image Garden for organizing and editing photos, and a solid driver. There are also the usual remote and email printing features. As mentioned, the MX922 automatically prints and scans in duplex. Paper capacity is good for a small office multifunction: 250 sheets, which reside in a bottom-mounted cassette that extends to handle legal-sized paper. Directly above the cassette and revealed when the front panel drops are a 20-sheet tray for 4-by-6-inch photo media and a feed for printable optical media. As with most Canon printers, the front panel drops automatically, so you can keep it closed for appearances yet not have to worry about a paper catastrophe if you print without checking the machine first. The pages emerging from the MX922 have the typical Canon look. That means sharp text, decent plain-paper graphics, and very nice photos. By default, the latter tend to look a tad light compared to the competition, but the color palette is essentially accurate, gradients are smooth, and details in dark areas are nicely defined. They photos are not quite up to what you'll see from high-end photo printers, but for a $200 MFP they're excellent. Speed-wise, the MX922 fell in the middle of the pack, but it's certainly fast enough for a small or home office. Text and monochrome newsletters with mixed graphics print at 8.6 pages per minute on the PC and 8.1 ppm on the Mac. Full color photos print about one every two minutes to glossy stock, but nearly 3 a minute to plain paper. Copies arrived at about 6.1 per minute, a very good pace. When we reviewed this printer's predecessor, the Pixma MX892, we complained about the lack of high-yield inks to cut printing costs. Canon apparently listened--this new model has them--but the costs didn't improve much. Color isn't bad, but black is high. With the standard size cartridges (the PGI-250 black and CLI-250 colors including a photo black), black pages cost around 5 cents and four-color pages, 16.6 cent per sheet. Using the XL cartridges drops a black page only to 4.6 cents, and four-color pages, 12.8 cents. There's an XXL black, but it only drops the price of pages another 0.2 cents. We also noticed that while the new inks have lower prices compared to the MX892's they also have lower page lives. Canon's warranty for the Pixma MX922 lasts a single year--better than the 90 days you get with entry-level MFPs, but not as nice as the three years you'll get with business-class inkjet MFPs such as the HP OfficeJet Pro 276dw. Canon did not provide a recommended or real-world monthly duty cycles, but judging from the quality of the construction, 250 to 500 pages might not be out of line. If you're printing or copying any more than that, you should be looking for something with cheaper inks. 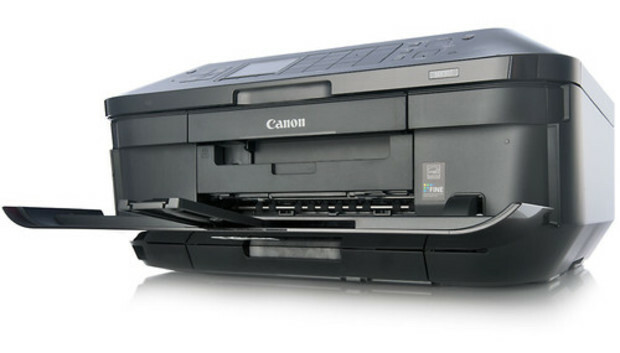 The Canon Pixma MX922 is a good MFP for the small office with moderate-volume copying and printing needs. The duplexing and output are sweet, and the fax is a bonus for those that need it. But we're not fans of the control panel. At the time of this writing, the MX922 was available for considerably less than the retail price we list here. It's a lot more appealing at around $150 than at $200, where it has to compete with the likes of the faster, more economical HP Photosmart 7520 e-All-in-One and the Epson WorkForce 845.